A spritely 100 year old Wing Chun lady practitioner. Shunde Wing Chun's butterfly knives form which is totally different from the Yip Man version. How Wing Chun's hand greeting differs from its Northern version and its combat application. 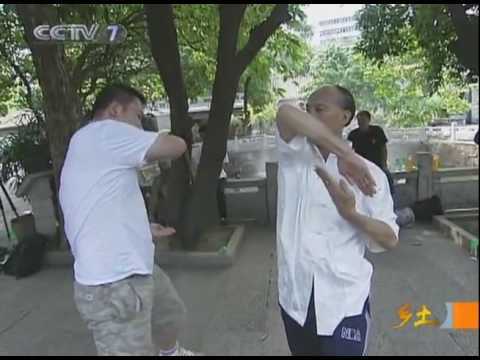 The application of double Gan Sau (Wing Chun's two hand side block). The application of Bil Jee's windmill arms as seen towards the end of the Bil Jee form. The commentary and dialogue is in Mandarin and Cantonese but non-speakers should be able to discern the action and concepts without too much difficult. A translation of the transcript is available here (scroll down for Part 2).